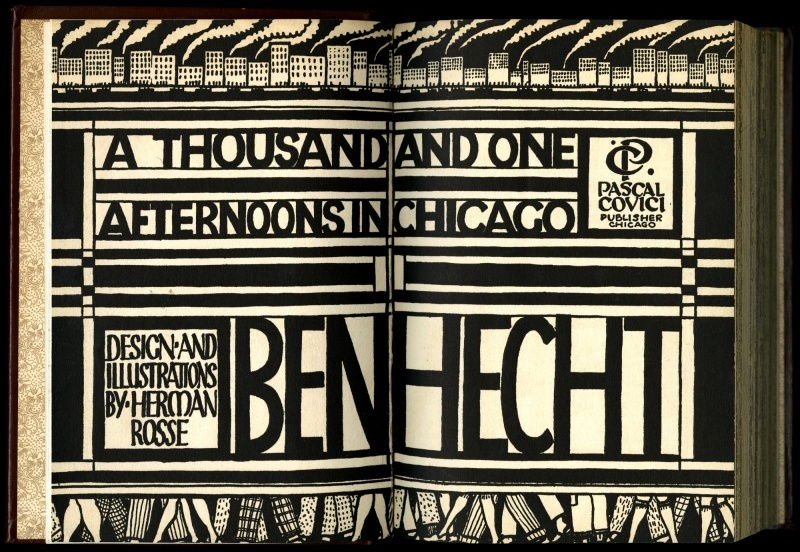 Ben Hecht’s book, opened to the first full-bleed spread, with illos by Herman Rosse. This alone is reason own “1001”, but it gets better from here. Image from the Newberry Library here in town. Don’t be mad, I’m promoting books! Today, a book interfered with all the work I was supposed to do. I’ll have to get up very early in the morning to catch up, but I don’t care. There was nothing I could do. Today, there could be nothing in the world — thank God — but this book, the delicate snowfall, and the pub where I sat, in the window, reading for two hours. The barstool I selected was inside Miller’s Pub, est. 1935, a Chicago institution, shielded and admired by the el at Wabash and Madison. The book, A Thousand and One Afternoons in Chicago, started as a column in the Chicago Daily News 1920s. The author, Ben Hecht, is a name some of you might recognize, but if you do, I’ll bet it’s because Hecht achieved screenwriting stardom in Hollywood in the 1940s, writing or doctoring scripts a whole bunch of classic films. But before he decamped for Hollywood, Hecht was a dyed-in-the-wool Chicago newspaperman. He started writing for the dailies here when he was just 15, and he was good at what he did. What he did was write well about stuff that happened in the city he dearly loved. Some years before the column began, Hecht left the News to work in publicity. He wanted to make more money and get away from the grind of reporting round the clock, so he went for it. He hated the publicity business, though, and was quickly miserable. His editor wanted him back and had an idea of how to get Hecht and keep him interested. He asked Hecht if he’d like to write a different sort of column for the News, one that explored the people of the city, but this time with a decidedly narrative tone. Hecht could interview people as he usually would, but then, rather than file a Q&A or a “This happened and this happened” piece of reportage, he’d have license to make the vignettes almost … poetic. For years. In the preface to the 1922 book containing dozens of these “afternoon” characters — this is the book I couldn’t put down this afternoon — I learned that Hecht loved writing this new column so much, he’d do it when he was sick, tired, traveling, depressed, etc. He called the column “A Thousand and One Afternoons in Chicago” (a Scherezade riff, obviously) and he filed a column every day. The humanity in these pieces is almost agonizing. Page after page of poignant, funny, achingly true portraits await you as the author tells Chicago through its people: prostitutes, auctioneers, homeless people, businessmen, shop girls, tattoo artists — this is all in the early 1920s, remember, but every single word is as true today as it ever was. People lose jobs and lose their families, they hope and dream, they forgive — sometimes they die, too. I was crying at the bar, trying to hide my face from the nice couple sitting to my left who were in Chicago for a nice weekend. I’m glad they didn’t ask me what I was reading; I would’ve rhapsodised and scared them away. The book is funny and beautiful and I want to share an excerpt with you. If you know me, you know I love Michigan Avenue. I walk up that grand boulevard and walk it all the way back down as much as I can and much more lately, since some days I just don’t know what to do with myself. On those days or any day besides, Michigan Avenue, from 9th Street to Delaware is my spinal column and it keeps me upright. So, imagine my rapture when I turned the page of Afternoons to find Hecht vignette about my street that was so right, so brilliant, so true, big, fat tears plopped onto the page as I read. There is no comfort like the comfort that comes when you see that you are known by someone who knew you before you were born. Here is an excerpt from the “Michigan Avenue” piece from A Thousand and One Afternoons in Chicago, by Ben Hecht, 1921. I have squandered an afternoon seduced from labors by this Pied Piper of a street. And not only I but everybody I ever knew or heard of was in this street, strutting up and down as if there were no vital projects demanding their attention, as if life were not a stern and productive routine. [There] was no sign, no billboard to inspire me with a sense of duty. So we strutted—the long procession of us—a masquerade of leisure and complacency. Here was a street in which a shave and a haircut, a shine and a clean collar exhilarated a man with a feeling of power and virtue. As if there were nothing else to the day than to decorate himself for the amusement of others. I begin to notice something. An expression in our faces as we drift by the fastidious ballyhoos of the shop windows. We are waiting for something—actors walking up and down in the wings waiting for the their cues to go on. This is intelligible. This magician of a street has created the illusion in our heads that there are adventure and romance around us. There are two lives that people lead. One is the real life of business, mating, plans, bankruptcies and gas bills. The other is an unreal life—a life of secret grandeurs which compensate for the monotony of the days. Sitting at our desks, hanging on to straps in the street cars, waiting for the dentist, eating in silence in our homes—we give ourselves to these secret grandeurs. Day-dreams in which we figure as heroes and Napoleons and Don Juans, in which we triumph sensationally our the stupidities and arrogances of our enemies—we think them out detail by detail. Sometimes we like to be alone because we have a particularly thrilling incident to tell ourselves, and when our friends say good-by we sigh with relief and wrap ourselves with a shiver of delight in the mantles of imagination. And we live a charming hour through a fascinating fiction in which things are as they should be and we startle the world with our superiorities. This street, I begin to understand, is consecrated to the unrealities so precious to us. We come here and for a little while allow our dreams to peer timorously at life. In the streets west of here we are what we are—browbeaten, weary-eyed, terribly optimistic units of the boobilariat. Our secret characterizations we hide desperately from the frowns of window and the squeal of “L” trains. The high buildings waver like gray and golden ferns in the sun. The sky stretches itself in a holiday awning over our heads. A breeze coming from the lake brings an odorous spice into our noses. Adventure and romance! Yes—and observe how unnecessary are plots. Here in the Circe of streets are all the plots. All the great triumphs, assassinations, amorous conquests of history unravel themselves within a distance of five blocks. The great moments of the world live themselves over again in a silent make-believe. The afternoon wanes. Our procession turns toward home. For a few minutes the elation of our make-believe in the Avenue lingers. But the “L” trains crowd up, the street cars crowed up. It is difficult to remain a Caesar or a Don Quixote. So we withdraw and our faces become alike as turtle backs.